What happens if you entered the wrong Passkey on your cell phone? If the Passkey you entered on your cell phone does not match the one generated or entered on your laptop, you Bluetooth connection will fail with errors show on both devices. 2. Turn on "Bluetooth" radio on your Windows XP laptop as shown in the previous tutorial. 4. Double click on "MYPHONE" Bluetooth icon and wait for the PIN code, 442912, to show up. 5. As the same time, your Samsung SGH-A777 cell phone will show a prompt: "Passkey to: MYLAPTOP"
6. Enter the PIN code, 219244, and press "Pair" on the cell phone. 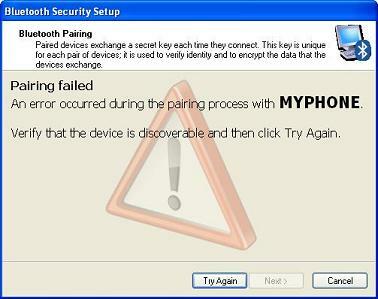 An error occurred during the pairing process with MYPHONE. Verify that the device is discoverable and then click Try Again.